Hi! I’m glad to hear you’re interested in a custom upcycled radio cabinet/tech center. There are lots of options available, and the cost varies for each. Contact me for an estimate! Note: I am not a wood refinisher. I believe that nicks and scars in the wood add to the piece’s character and beauty; restoration may also damage the value of the piece. I will be happy to supply photos of the available housings I have in stock, and you can choose the one you like best. I can provide reproduction faceplates, if you want your tech center to look identical to the way it did during its life as a radio. I prefer to add specialized art and design elements; I have been daydreaming about a Tiffany-inspired retro sci-fi stained glass painting, or a meniscus-lens-and-resin kaleidoscope rose window, or a vintage map of Cleveland. Check my Pinterest board for other ideas: a WPA poster, a print of the Guardians of Traffic, or a piece of vintage fabric. I can also help produce static or digital collages of family art and mementos, if you have things like family photographs, costume jewelry, or fabric you’d like to incorporate. 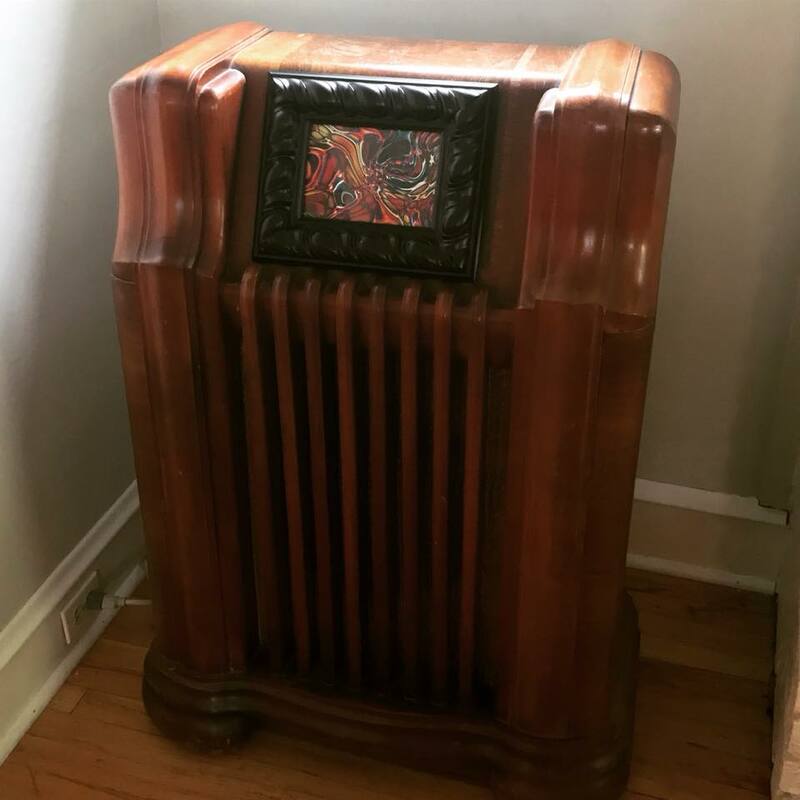 If you have compact technology needs, I’m also willing to work with a vintage sewing cabinet, stereo, or other piece of furniture; let me know what you’re interested in, and I’ll see what I can do. Charging station for USB devices: Let me know how many charging ports you need, and what your devices are, and I will source the appropriate station or splitters. Newer iPads and iPhones require high-capacity ports, whereas battery packs, toys, etc. can charge off a standard port. If you need battery packs or cables, I can source those. Bluetooth speaker: I have a tiny portable Bluetooth speaker, but I'm not an audiophile. If you'd like Bose or Sonos systems, I can help you source those. I like to listen to Radio Dismuke on mine, or to vintage soundscapes, or historic speeches. Wifi/router: If you have an existing modem and router, or if you rent one from your ISP, please send me the brand names and model numbers so I can design storage space for them. If you would like to purchase a new modem/router combination, please let me know and I can provide one. Power strips/surge protectors: every unit needs at least one. These range from a simple six-outlet surge protector to a battery backup that will keep your tech running through a temporary power failure. Please let me know what your house outlets look like; if you don’t have grounded outlets (three-prong), you’ll need adapters. They aren’t recommended by electricians, who would prescribe a grounded outlet or a GCFI, but rewiring your home outlets is beyond my scope of work. Hard drive/server: If you have an existing external storage system, let me know what it is and I can build a place for it. If you’d like one, I can source whatever you would need, but I personally recommend cloud storage for most things. I subscribe to Google Drive, which is affordable and simple to use. Video: I can install an iPad, DVD player or other tablet in the radio housing, either in the faceplate (a relatively permanent installation) or on a stand on top (removable for other uses). Let me know if you want a touchscreen interface and what technology you currently use, and whether you want to purchase a new tablet to provide a dedicated interface for this machine. If you use a Roku or Slingbox or other video equipment, let me know. I can also install a digital picture frame if you want to display photos or art. Prices start at $350. Technology and custom art adds to the purchase price. I do require an advance, nonrefundable deposit of $100 plus the price of any technology that I purchase on your behalf. I accept PayPal, Venmo, Cashapp and Zelle. Delivery: I can deliver in the greater Cleveland area for an additional $75, or you can pick up your finished piece when it’s ready. Shipping outside of Cleveland is based on actual shipping cost to your location and starts at $250.